When reading about the history of fiber art it seems to take on many elements. The history of fiber art incorporates craft, textile and design elements that are not usually explored in regular art history. The use of embroidery and clothing inspired artists such as Sonia Delaunay who had started off as a painter and found new inspirations when she shifted her medium from brush, canvas and oil paint to needle, thread and textile printing. In exploring Sonia’s textile and wearable art works I’d like to explore her success as a woman in the art world. At the time she was recognized as a great artist and today as well, in relation to her husband Robert Delaunay. This paper will explore her innovative ventures into textile and clothing design and the importance of her work in fiber history. 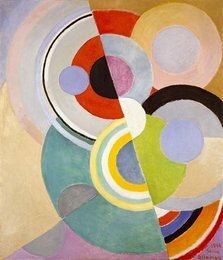 Ukraine born, Russian raised, Sonia Delaunay started her artistic life as a painter and graphic artist. (Roatclap 3) Inspired by French impressionist she moved to Paris with her husband Robert Delaunay. She created an early movement of abstract art called Orphism. Figure 3. Sonia Delaunay-Terk, Baby Quilt, 1912. Wool, silk, and fur. Figure 4. Sonia Delaunay-Terk, Simultaneous dress, front back Paris, 1913. Cabaret Voltaire around 1916. This group had an appreciation for the everyday object and had liberal attitudes about arts and crafts. (Buck 55) The idea of “spontaneous creativity” was both a stylistic ethos of the Dadaist movement and descriptive of the way Sonia created her designs by finding poetry in every day objects and living. (Buck 55) She began fusing poetry into her clothing designs “dress-poems” using poetic words in her designs integrated with geometry, including a dress worn by Igor Stravinsky’s wife. (Buck 59) Sonia’s creative performance pieces and textile prints were innovative and fresh design for the fashion world. It was the perfect marriage of her art and craft. She established her own printing workshop where she had more control of her medium and could regulate and blend her own colors. (Buck 65) In fall 1924 her operation was in full operation and she hired a staff to do embroideries. Her clothing designs were very successful. Sonia’s designs had women feeling very liberated as they allowed for greater freedom of movement and increased comfort. At this time, post World War 1, many of the textile and clothing designers in Paris were women. Also tango was a big craze at the time Sonia’s Simultaneous dress was designed to be comfortable and allowed ease of movement (Albritton 8) She designed clothes for many in the “bourgeoisie” as well as her friends in the artistic community. 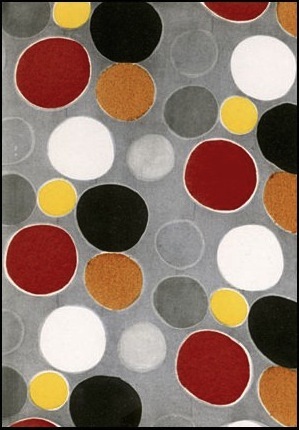 Sonia’s textile designs had an element different from those of past decorative designers. Her prints had a painterly quality to them. Sonia thought like a painter therefore she designed her fabrics using form and balance and color. Recently attending an exhibit at the Smithsonian Cooper Hewitt Design Museum in New York City, I was able to see her prints first hand. Her love of geometry was very apparent and use of patterns was incredibly intricate. Although her prints were geometrical it showed that she used paint to sketch out the prints therefore you can feel a handmade aspect to the prints. Texture of the brush leading to a slight unevenness of the color. I enjoyed this aspect in the fabric prints, as it seemed to add movement. Perhaps this was her intention, which fit with her explanations of Simultaneous art. 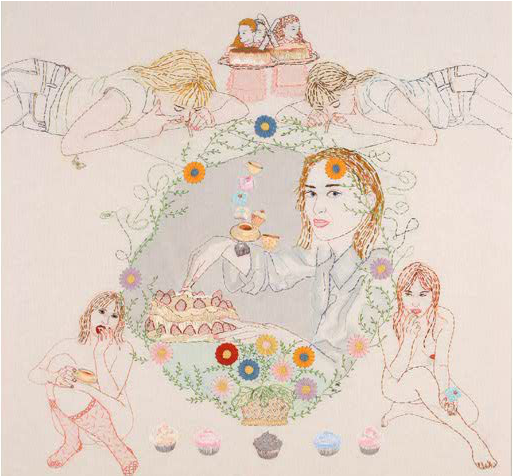 Sonia’s use of embroidery in her work is intriguing. This was her way to discover new ideas and explore color in a different way she could of in her paintings. The same holds true with her quilting and dressmaking. She felt a strong cultural connection in this work. When comparing Sonia’s embroidery work to the subversive stitch by Roszika Parker, I found a quote that explains how Sonia referred to embroidery. 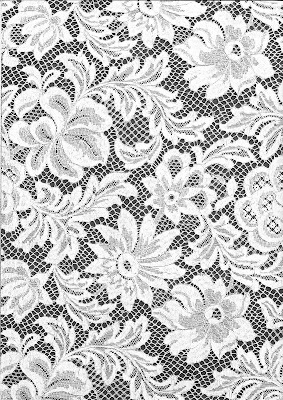 Parker mentions when referring to the arts and crafts movement “They too believed in the transformative power of the arts not only on society but also on the lives of the practitioners.” (Parker xxii) The freedom Sonia found in her embroidery developed her artistic practice from then on. The ideas behind the arts and crafts movement were something Sonia believed in. She already worked in this way as she believed art should be “applied through all aspects of life” (Buck 56) Also found that her Dadaist friends in Zurich had a found sensitivity to applied art to everyday objects and influenced their opinions on arts and crafts. According to Adela Spindler Roatcap, art history books mainly mention the work of her husband Robert Delaunay. (Roatcap 3) I find this surprising as Sonia seemed far more successful than her husband in her career as an artist and designer. When she is mentioned in books she was labeled as a “decorative artist”. (Buck 102) Often this happens when a husband-wife artist team the husband becomes the “leader” or the genius of the two. Luckily for Sonia she is recognized as a great and talented artist that is giving her high praise and the “artist genius” status she deserves. Proving that female artworks of the past should be re-examined with contemporary ideology. Sonia’s success as a woman during that time was remarkable. She was surrounded by the elite of the cultural establishment of that time and place such as poets, writers, painters and dancers. This kept her constantly in the art world loop. Her first solo show was held at the gallery of her first husband, Wilhelm Uhde who was an art critique and dealer. There she met Picasso, Braque, Derain, Vlaminck and Robert Delaunay. (Morano 12) I mention these names not suggesting that she owes her success in any way to the people in which she met put mainly to illustrate sociologist Pierre Bourdieu’s theory on the field of cultural production with the artist genius. In many cases I have read about this theory that was used for male artists in history. 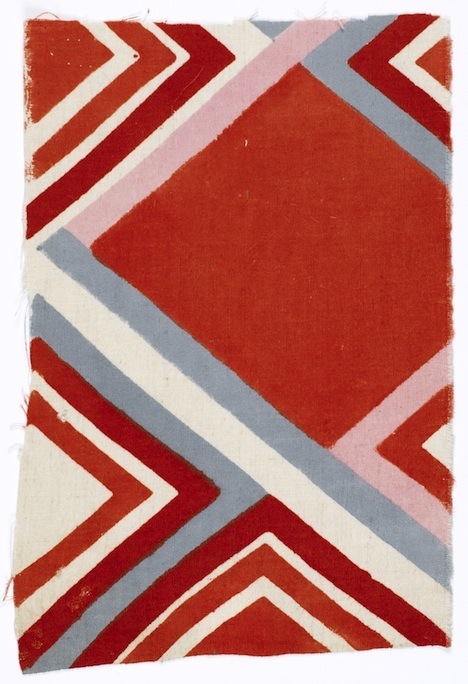 Sonia Delaunay’s surroundings helped contribute to her success. In the research I have found her being referred to a genius. A quote by Diana Vreeland in Art into fashion says,” Displaying the resilient confidence of intuitive genius.” Sonia seemed to have had a very well developed field of cultural production. Her progression into textile designs was lead to her having to support her family. This was after the Russian revolution as the family funds she was receiving were confiscated. (Morano 14) This natural switch was out of necessity but not entirely selling herself out. I find it interesting that during the 1920’s as a woman she was able to support her husband and son and did so very successfully and always respected her artistic integrity. Sonia’s transformative style in the creation of wearable art pieces in the 1920’s was a remarkable accomplishment. Her contribution to the art and fiber art world should be acknowledged. The inspiration she found within her Ukrainian and Russian roots inspired her to begin embroidering and develop the carefree gutsy designs she created. From her simultaneous dress, dress-poems to her textile fashion able designs she was true to her artistic vision and constantly innovative. Bold textile works and color expression made her stand out. She added colorful prints at a time when the fashions were drab and in need of a fresh change. Exhibits like Color Moves; Art and fashion By Sonia Delaunay at the Smithsonian Cooper Hewitt Design Museum in New York City, shows the admiration for her work in this present day. 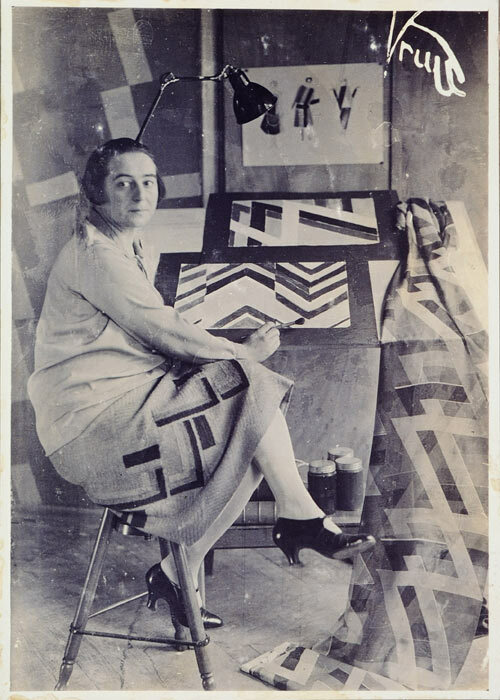 As a woman Sonia Delaunay contributed a lifetime of creative work that is respected today and because of that being written about in history books finally getting the credit she deserves. Ann, Albitton. "She has a body on her dress: Sonia Delaunay-Trek’s first Simultaneous dress 1913." Dress vol32 (2005): 3-13. Dress. Web. 9 April. 2011. Robert T. Buck. Sonia Delaunay: A retrospective. Buffalo, New York: Albright-knox Art Gallery, 1980. Print. Matthew, Collings. "No 17: Sonia Delaunay." Art rev no41 My (2010): 46-8. Art Review Ltd. Web. 9 April. 2011. Elizabeth, Morano. Sonia Delaunay : Art Into fashion. New York: George Braziller inc., 1986. Print. Roszika, Parker. “Forward and Introduction” in The Subversive Stitch: Embroidery and the making of the Feminine (New York: Palgrave MacMilan, 2010): Ix-xxii. Adela, Spindler Roatcap. "Sonia Delaunay: Color, Rhythm, Simultaneity." Letter Art Review 18 no4 (2003): 3-13. Lett Art Rev. Web. 9 April. 2011. Figure 2. Sonia, Delaunay. Rythme Colore. Robert T. Buck. Sonia Delaunay: A retrospective. Buffalo, New York: Albright-knox Art Gallery, 1980. Print.p183. Figure 3. 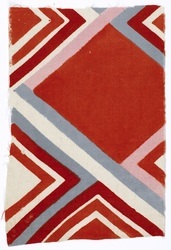 Sonia Delaunay-Terk, Baby Quilt, 1912. Wool, silk, and fur. Ann, Albitton. "She has a body on her dress: Sonia Delaunay-Trek’s first Simultaneous dress 1913." Dress vol32 (2005): 3-13. Dress. Web. 9 April. 2011. Figure 6. Sonia Delaunay-Terk, Simultaneous dress, front back Paris, 1913. Wool, silk,velvet, and fur. Ann, Albitton. "She has a body on her dress: Sonia Delaunay-Trek’s first Simultaneous dress 1913." Dress vol32 (2005): 3-13. Dress. Web. 9 April. 2011. When stepping into fashion history we can’t help but notice the variety of shapes women’s garments have been molded into creating many modified silhouettes. Most of these exaggerated forms were achieved from the wearing of foundation garments especially during the 19th century. Caged structures creating volume, structures that warped the body part inwards and those that added bumps for exaggeration. This constant re-shaping of the female form was being continuously reinvented. Women’s bodies were pushed into anything but the natural form! Contemporary artists like Jana Sterback, Sarah Garzoni and designer Rei Kawakubo have recontextualised historical garments into thought provoking art. These specific artists use elements of the crinoline, the corset and the bustle: these foundation garments that have altered the woman’s form by limiting motion and inescapable constriction. Remote Control, Breeching and Dress meets body meets dress are three contemporary pieces that illustrate the conceptual exploration of some complications in historical garments. How do these works address possible issues of foundation garments? What sort of concept of body image do they explore? How do they communicate the issues found when those garments were worn? Presenting these three works together will allow the viewer to deconstruct and learn about the possible problems behind these particular foundation garments. 19th century foundation garments; the crinoline, the corset and the bustle. 1868 brought on the invention of the bustle, also called a Tournure (Corsets and Crinolines 121) It gave women better ease of movement and shifted volume onto their posterior. Several versions were made out of metal, horse hair, and even ones resembling stuffed fabric buns. There were also short ones for walking or light activity and long ones used for evening wear. The bustle was worn with a corset so it completely altered a woman’s figure top and bottom. This exaggeration of the posterior area according to a women’s contemporary magazines in 1884, it was seen as “…a little absurd, the tournure has reached ridiculous proportions and from day to day the eye becoming used to the effects has become blinded to the ugly side of stylish mode.”(Waugh 127) The bustle, when entering the fashion market seemed possibly quite avant garde in the way it distorted the body. Fashion often looks back into the past and the same can be said about art. Jana Sterbak visits the embodiment of the crinoline in Remote Control (I and II). This work is not only meant to be seen but also to be worn and performed in. The construction holds a woman’s body suspended with legs dangling in a harness this leaves the lower body useless and the upper body stiff. 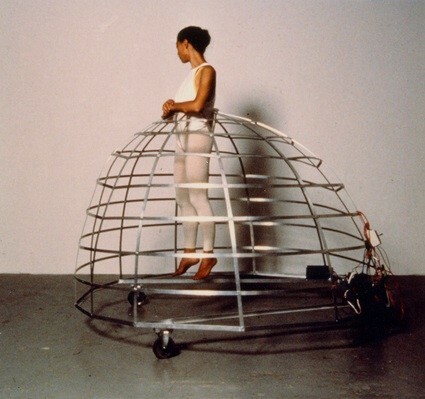 (McLerran543) The cage’s movement is controlled electronically by a remote control that can be manipulated either by the wearer or by the viewer. 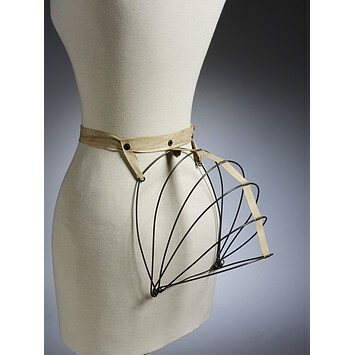 (McLerran 543) Sterbak’s remote control cage was drawn from the shape of a model from an 1856 crinoline, which enhanced the hips and restrains the wearer. Here she demonstrates the helplessness through the mechanism of the cage making the wearer feel trapped. (McLerran 543) Remote Control allows us to wonder about the mobility women actually had while wearing such garments. When thinking about these elements in a fashion history context, the devices Sterbak used explore the loss of power women might have felt. Sarah Garzoni Breaching demonstrates a visceral need to demonstrate a crisis. (Yukiko Kawase Gallery) Her beautifully constructed corset sits laced laying on it’s side so we can see its internal structure. Where the body would have braced the lining are carefully placed shark teeth, around one thousand in total. The use of shark teeth links the wearing of the corset to pain and mutilation of the body, making the intent of the work visceral. Garzoni is addressing the mutilating effects the corset has had on women in the history of fashion. One interpretation of Garzoni’s piece is that the idea constructed out of attaining a level of dictated beauty leads to a breaching point, a crisis imposed to women’s bodied during the Victorian era. The crisis being the many health risks brought on by the corset including possible death in extreme cases of tight-lacing. Breaching is certainly commenting on the painful effects of corsetry, which was existing, but what about the idea of the corset being empowering? Corsets were not forced upon women by men, women accepted this foundation garment enough so that they wore them for 400 years. (Steele 35) So does Garzoni’s piece complicate the matter of the corset or do we still become mesmerized in her beauty as an object? Rei Kawakubo’s put it best when describing her idea of fashion as “We must break away from conventional forms of dress for the new woman of today we need a new strong image, not a revisit to the past.”(Morris 40) Exhibiting a piece from Commes de Garcon 1997 collection called Dress meets body, Body meets dress (also known as the Bumps and lumps collection). This piece is an exploration of asymmetry using padding to modify the body into exaggerated forms. (Richards 110) Very similar to what the bustle once did to women’s dress. 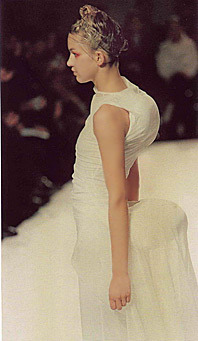 Kawakubo was trying to defy the ideas of conventional body shapes used in contemporary fashion. Her fresh reformulating of the body’s anatomy with the placement of these unusual organs creates a whole new silhouette never really realized before. Kawakubo has taken the conventional guidelines for beauty and has forced us to challenge them. 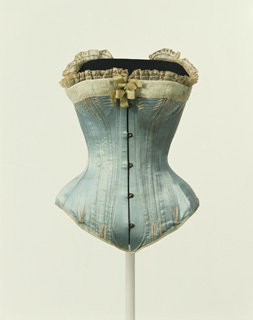 (Koda 34-35) In the specific piece in this exhibit the lumps and bumps are placed in a way that mimics the look of the bustle. Although a bustle was often made of rigid metal or horsehair, Kawakubo’s bumps are filled with down feathers making the piece extremely light and even comfortable. (Thurman 59) Both the bustle and Kawakbo’s Dress meets body meets dress morphed and moved way from the natural bodies shape. Kawakubo's intent was to put forward postmodernist mind-frame as could be said about the advent of the bustle. The shape of Victorian era of fashion was made possible by these incredibly engineered foundation garments. 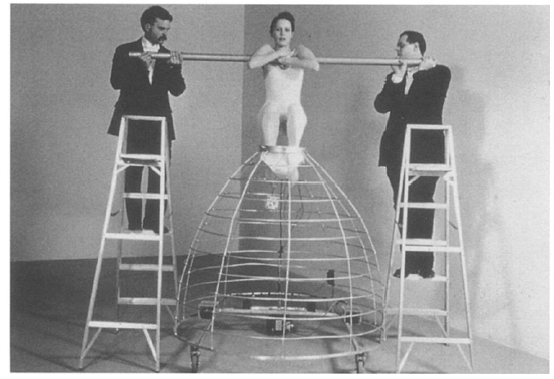 Although the 19th century brought on explorations and experimentation on the altering of the female figure they also created the problems and mobility issues. Why were such extreme measure taken to alter the female form during this time? This exploration in body shaping was necessary to lead to the Fashion innovations of the 20th century. Jana Sterbak’s reinterpretation of the crinoline, Sarah Garzoni’s commentary on the corset and Rei Kawakubo’s morphing of the body all demonstrate that looking to historical foundation garments and understanding their use, power and subversion can help us understand them more. These artists push ideas of altering the natural body’s form in fashion history expressed within an art practice. What does the future of dress hold for us next? What will be communicated about the beauty standards of our time? Whatever does happen body shape in fashion will always evolve and women will brace themselves and hope that whatever happens it better be comfortable. Cooper, Cynthia. 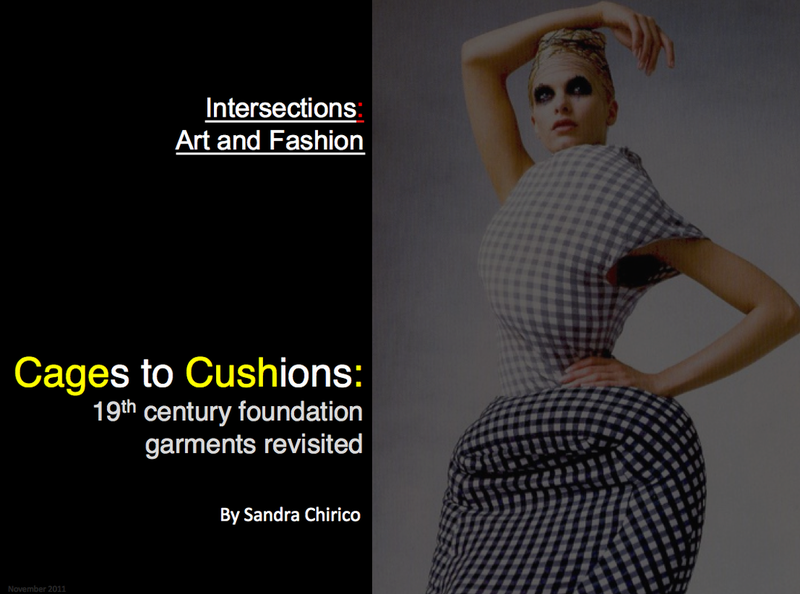 “18th-century fashion and fashion exhibitions.” Lecture at Concordia University, Montreal, QC, October 7, 2011. Koda, Harold. “Rei Kawakubo and the art of fashion.” Refusing Fashion: Rei Kawakubo. Detroit: MOCAD, February 2008. McLerran, Jennifer. " Disciplined Subjects and Docile Bodies in the Work of Contemporary Artist Jana Sterbak.” Feminist Studies, Vol. 24, No. 3 (Autumn, 1998), pp. 535-552. Accessed November 21, 2011. http://www.jstor.org/stable/3178578. Morris, Bernadine. "The New Wave from Japan." New York Times Magazine 30 January 1983: 40. Thurman, Judith. “The Misfit.” Refusing Fashion: Rei Kawakubo. Detroit: MOCAD, February 2008. “Sarah Garzoni Breaching.” Galerie Ykiko Kawase. Accessed November 24, 2011. http://yukikokawase.free.fr/SGbreachingtext.htm. Figure 8. Jana Sterback Remote Control (I&II) 1989. From article. McLerran, Jennifer. " Disciplined Subjects and Docile Bodies in the Work of Contemporary Artist Jana Sterbak.” Feminist Studies, Vol. 24, No. 3 (Autumn, 1998), pp. 535-552. Accessed November 21, 2011. http://www.jstor.org/stable/3178578. Today, fiber related craft processes are commonly used in contemporary art practice. Yet the debate over craft versus art seems to always lurk in the shadows. What is craft and where it belongs in the art world is an inevitable discourse when discussion craft in contemporary art. Fiber related crafts such as knitting, weaving, sewing, and embroidery are all traditional based and were mainly practiced by women. I’ll be discussing works by artists who explore issues like social protest, gender, labor, and feminine stereotypes. The artists I will discuss works from are Dave Cole, Marianne Jorgensen, Orly Cogan, and Shelley Socolofsky. Each of these artists use craft not only as their process but have made it part of the meaning behind their work. The use of traditional craft methods in contemporary art is on the rise one reason can be because of the strong messages already embedded in material and process. How has the stigma surrounding craft based work effected how it is received in contemporary art? Today’s artistic craft practice is a relevant part of contemporary art and is recognized. I’ll be looking into 3 craft methods that relate to textile such as embroidery, knitting and weaving and artist who use these methods in a contemporary way and analyze how they fit in the art world and surpass the category of craft. Historically the discourse considering craft as an art form states that craft must be a physical object made by hand using traditional methods and because of this it limits the art works aspect and meaning. (Metcalf 70) Bruce Metcalf states that “The craft world accepts the meanings of felt experience and the body, whereas the art world remains dedicated to meaning embedded in texts and discourse.”(Metcalf 80) How is it that craft making used in a traditional sense can’t have such meanings? 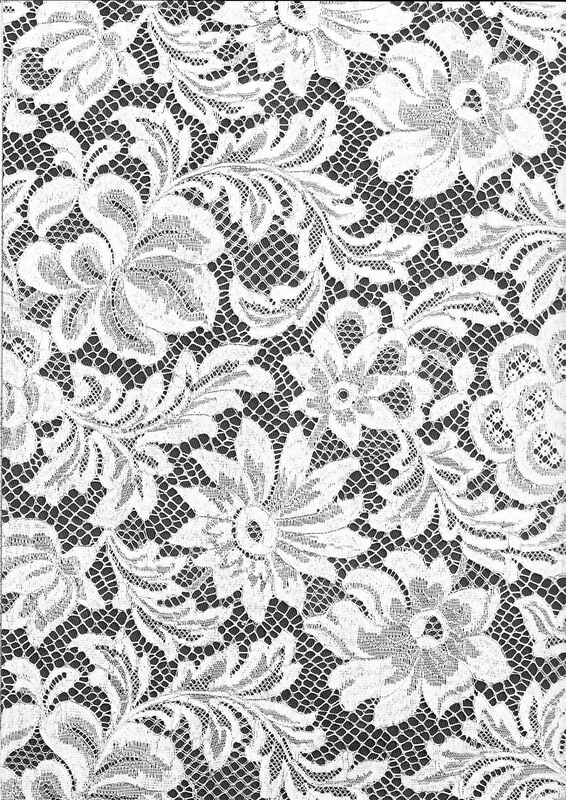 In the past craft makers such as weavers, knitters or embroiders for example perfected their techniques and became masters of their craft. At the time these skills were not only traditional but also essential to life. The industrial revolution changed this around with the invention of machines. William Morris, a crafts man during Victorian era stated “… the automatic machine which supersedes hand labor, and turns the workman who was once a handicraftsman helped by tools, and next a part of a machine, into a tender of machines.”(Morris 150) Perhaps having their work become mass-produced tainted most crafts and possibly the cause for all these debates. Crafts slowly began to decline throughout the 20th century practiced mainly by housewives and hobbyists. Fast forward to the 21st century where machines are part of everyday production. In fact garments for instance are mass-produced to a point where we don’t know the individual who produced them, anonymity becomes the norm to something centuries ago would have been custom build and cherished. In that time custom crafted items were sought after, just like art is sought after today. Art has been able to make the creator of the work become acknowledged and important. So it is only natural that in the past few decades there has been a return to the handcraft in a contemporary art spectrum. Artists who have been drawn to traditional techniques and use them as their practice allow the process to become part of the language in their art works. Cogan’s work takes this very idea by juxtaposing typical feminine imagery with contemporary pop culture. The cocaine use is associated with pop culture ideas on partying. Having this piece made using embroidery speaks as loudly as the imagery. This piece is very strong in content and because of its conceptual messages in breaking female stereotypes fit the contemporary art spectrum. Knitting was usually associated with grandmothers and baby booties. A resurgence of knitting has recently gained great popularity as a cool pastime. So how can this be even regarded as an art practice? Artists like Dave Cole and Marianne Jorgensen have found ways to adapt knitting in their art practice in very different ways. Exploring process materials, collaboration and social protest. Artist Dave Cole has surely picked a medium not normally practiced by men. He learned knitting and realized it helped him pay attention in his classes which was caused by his hyper activeness. He uses the medium for what it is because he doesn’t hide the fact that knitting has connotations with warmth, home, protection and childhood. Also kitting is seen as a “feminine process” on this Cole states “A basic element of my work that I’m subverting the feminine process. I think I’m subverting this more that I’m subverting the masculine material.” (Cole 40) He will often use subversive materials such as Kevlar, fiberglass and exposes even the technique by leaving the knitting needles in the piece. He has also done knitting with non-traditional object such as using pistols. He has also played with scale, like in his piece the Knitting machine where two excavator trucks and aluminum poles knitting a very large American flag. His piece Fiberglass Teddy Bear caught my attention because of its size, technique, material and imagery. The piece is a huge teddy bear knitted entirely out of fiberglass. 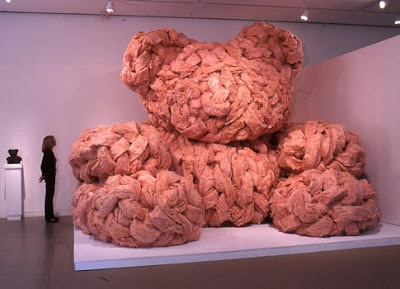 The size of the piece is 14x14x14 feet is an overwhelming structure in pink fluffy fiberglass. It is hard to fight the urge to wrap your arms around the fluffy structure yet because of the material it is not possible. It’s almost as though the artist is toying with our emotions. His use of knitting in this piece gives the viewer a sense of familiarity the feeling of warmth and home come to mind and the imagery of the teddy bear connect to memories of child hood. pink knitted squares assembled together and fit over a tank that was on display in a public space. A collective of people knitted the hundreds of patches all in unique patterns. No two patches are made the same. Jorgensen wanted to protest the Danish involvement with the war in Iraq. The blanket covering the tank symbolically disarms the tank rendering it useless no longer a threat. Each knitted square is like a protesters signature. (Black, Buisch 611) Jorgensen’s Pink M.24 Chaffee is very successful because protests and petitions are done as a group therefore justifies the collaborative element in her work. 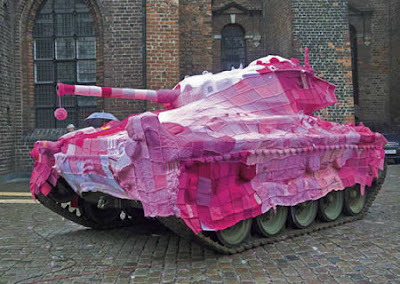 Also having the piece knitted and being soft up against the heavy metal of the tank act as a great contrast and the pink color suggests a comforting feminine gesture against war. The possibilities of using fiber craft based techniques are endless, demonstrated by the artists I have discussed. They are able to combine fiber craft techniques and make innovative work with embedded meaning and explore human social issues. There is no reason to question craft processes as not being part of contemporary art as I believe this is an outdated idea. In today’s world with mass production and the anonymity of items labeled “made in china” have made us hungry for hand made art, especially art that uses tradition methods. Labels like neo craft, craftivism and DIY culture are showing up everywhere as in web communities and lifestyle magazines inspiring a new generation of crafters. (Adamson 555) If these artist hadn’t picked up processes such as weaving, knitting and embroidery they would one day become extinct. The stigma that once surrounded the use of craft in contemporary art should no longer exist as artist have proven that they still have meaning in their work. Even if the process affects their artworks that actual process becomes part of the meaning behind their art. Contemporary artist let us view these methods using postmodern thinking while adapting traditional craft methods. This proves that craft is both embedded in new meaning and has a promising future in contemporary art. Adamson, Glenn., ed. “Section introduction: Contemporary Approaches.” The Craft Reader. Oxford, New York: Berg Publishers, 2010. 555-587. Print. Black, Anthea, Burisch, Nicole. "Craft Hard, Die Free: Radical cuatorial stategies for craftivism in unruly contexts." The Craft Reader. Ed. Adamson, Glenn. Oxford, New York: Berg Publishers, 2010. 609-620. Print. Cole, Dave. "Dave cole." By hand. Ed. Hung, Shu, Magliaro. New York, Princeton Architectural Press, 2007. 40-44. Print. Hung, Shu, Magliaro., ed. By Hand: The Use of Craft in Contemporary Art. New York, Princeton Architectural Press, 2007. Print. Lane, Mary. “Fertile Associations the Tapestries of Shelley Socolofsky.” Fiberarts Summer (2005) p 50-3. Metcalf, Bruce. "Craft and art, culture and biology." The Culture of Craft Status and Future. Ed. Dormer, Peter. Manchester and New York: Manchester University Press, 1997. 67-81. Print. Morris, William. "The Revival of Handi Craft." The Craft Reader. Ed. Adamson, Glenn. Oxford, New York: Berg Publishers, 2010. 149-156. Print. Parker, Rozsika. The Subversive Stitch. London, The Women’s Press, 1984. Print. Figure 2: Cole, Dave. Fiberglass Teddy bear. 2003. By hand. Ed. Hung, Shu, Magliaro. New York, Princeton Architectural Press, 2007. 41. Print. Figure 3. Jorgensen, Marianne. Pink M.24 Chaffee. 2006. Wichita Art Museum, Wichita. The Craft Reader. Ed. Adamson, Glenn. Oxford, New York: Berg Publishers, 2010. 613. Print. Figure 54. Figure 4. Socolofsky, Shelley. Incantations. 2005. Fiberarts Summer (2005) p 53.